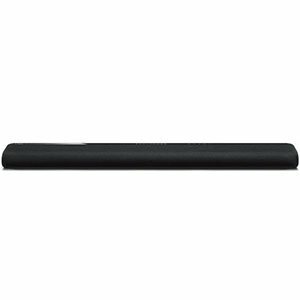 Affordable soundbars come in a variety of different flavors. Some like the ones found in the $100 range, bring the bare minimum. Once you move up a notch, you start seeing a more complete and refined build. In most cases, $200 range is recommended as a starting point. Even for the budget crowd. Going even further, into $500 soundbars is great, however, a $200 unit will get you a very decent performance at an attractive price. Today we’re going to show you our top 3 best soundbar speakers in this category, and why this price range is a good starting point. The app provides a good amount of customization and flexibility. Yamaha’s design is elegant, simple, and will work well anywhere. Audio performance vastly exceeds what you would expect from the form. A small amount of input lag from the remote, but not a dealbreaker. Yamaha, once again, has proven that they are a serious player in the consumer audio market. Despite the fact that they have decided not to include a wireless subwoofer with this model, the YAS-107BL proves that it is more than capable of managing without it. A high quality, elegant design masks powerful internals that will truly transform your audio experience. We had some issues when it came to using the included remote control which seemed to suffer from noticeable input lag when interacting with the device, but this was hardly a deal breaker. 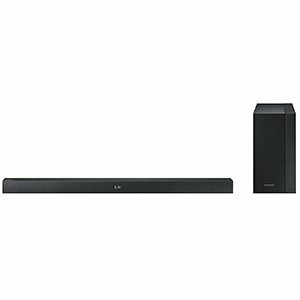 Overall, the sheer excellence of both the aesthetic design and the sound quality on offer make this a fantastic choice for those who are seriously interested in soundbars. Solid performance for the money. Wireless subwoofer with a great range. It doesn't dig as deep in the lows as we would like. 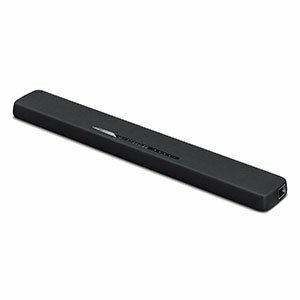 VIZIO SB3821-C6 is among those affordable soundbars which really give you your money’s worth of performance. This sleek system features a wireless subwoofer and a very decent set of full range drivers. It’s loud, brings enough definition, and won’t break your bank account. In other words, it is a great affordable solution. Despite the volume that this device is capable of outputting, we found the bass response a little underwhelming at times which may affect your decision if you are all about that bass. The wireless subwoofer does a good job of creating the illusion of a richer bass in the room itself, however, so this is not a huge issue. Overall, a great choice for this particular price point. 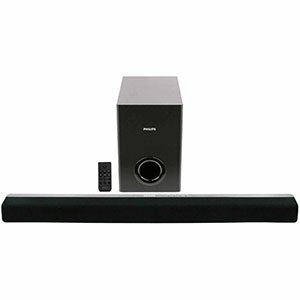 Sony CT290 is an old school soundbar that is updated with modern features. It comes with a subwoofer and 300 Watts of combined power that is available at any time. However, Sony went a step further and loaded this thing with cool stuff. Overall, it is one of the best in its class at the moment. The sound quality is extremely solid for this price range, with an extremely solid response in the low end which is often lacking in soundbars as a result of the form factor. The subwoofer does a lot of work in this regard, and makes for a fantastic listening experience as a result. While not everyone will love the design, it is simple enough to be unobtrusive. Careful attention has been paid to the visual appearance of this device, and the mirrored finish on the caps provide a nice flair to an otherwise extremely unobtrusive, sleek design that does not draw the eye unduly. The proprietary Surround Sound Expansion system does just what it says on the tin, and makes a huge difference to the overall immersion of your listening experience. Lots of power at your disposal. Positioning the soundbar on a wall is tricky due to a wired subwoofer. 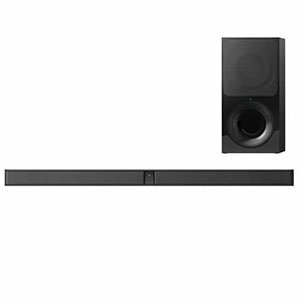 Philips CSS2133B-F7 comes across as one of the most balanced soundbars in its respective price range. They have focused mainly on performance, and that shows. It’s a clean looking unit that brings decent tone as well as a great selection of features. Bang for the buck, CSS2133B-F7 is a bargain at the moment. Despite the fact that this is an extremely powerful soundbar with a good selection of features on offer, we have to take some points away for the cumbersome design choice that was only including a wired option for the subwoofer. This can make it quite difficult to find a good place for the soundbar and subwoofer combo, which may impact your decision to purchase this particular model. 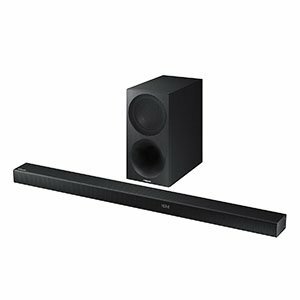 The Yamaha YAS-106 is a compact but powerful soundbar that is capable of moving some serious air. With built-in subwoofer cones, two full range drivers, and two tweeters, you are looking at a fairly wholesome TV experience. Best of all, this package comes at a price that makes it extremely competitive. If you are a fan of a high profile bass response, then the YAS-106 performs just about as well as you could hope for from a soundbar in this price range. Despite its small form factor, it delivers a fantastic performance in the low register which, sadly, the highs cannot compete with. As with most Yamaha products, it’s a great looking device with a gorgeous glossy finish. Good response across the range. Samsung’s HW-M360ZA is definitely not the best-looking soundbar in its respective category. However, the performance it offers, the wireless link between elements, and lots of power make it one of the best bang for the buck deals out there. 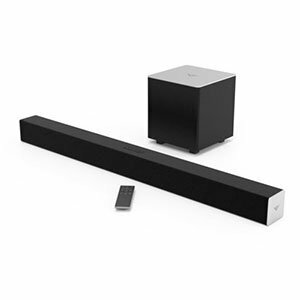 If you are on a budget but still want something a bit refined, this is the soundbar for you. Despite its somewhat generic appearance, the internals are where the magic really begins, and this model is capable of outputting a good deal of volume and nuance in its performance across a wide range of tracks, genres, and use cases. In particular, dialogue is reproduced phenomenally making it very easy to hear what’s going on in TV and films alike. A solid choice. The general understanding is that $100 soundbars are the bare minimum of what this type of device is capable of offering. By this, we mean that you get a decent core performance that is often burdened with compromise. On top of that, you might see Bluetooth support as well. However, that is as far as things usually go. Power is very limited, the number of speakers is almost exclusively two and subwoofers are borderline nonexistent. One you step into $200 price range, things change considerably. If you look at our top picks for this list, you will generally see what those changes are. The first noticeable upgrade is the power rating. You are looking anywhere from 120 Watts to 300 Watts of power. This translates to being able to crank up the volume without walking right into distortion. Next obvious upgrade is the subwoofer department. Just like it is the case with your regular speakers, having a subwoofer dramatically changes the landscape of sound you get. That is why some of the best soundbars available almost always come with a subwoofer of some kind. Full range drivers are great, but being jacks of all trades, their performance is stretched thin over a wide frequency range. With subwoofers, you can get those booming basses we all love. Aside from the physical configuration of the soundbar, we have to acknowledge the fact that most $200 models come with an HDMI in of some sort. Seeing how most modern TVs use HDMI as standard, having this port alone makes saving up for a $200 bar worth it. Discussing performance of sound bars in this price range comes down to dynamics and definition of sound. Some are good, some not some much. We need to remember that $200 still makes it challenging to deliver a high-quality performance. At the end of the day, opting for a soundbar like the ones listed above is generally seen as a sensible move for those working on a budget. Once you move from that $100 mark, even barely reaching the half-way point to $200, you will run into serious performance increase per dollar invested. Best thing of all, most of these systems come with solid expansion paths, making them an extremely versatile set. Soundbars are becoming a necessity more than anything else. Modern TVs are becoming thinner and thinner, thus limiting what built-in speakers can give you. With that said, a $200 soundbar is more than capable of significantly boosting the quality of your TV experience. Models such as the ones we’ve listed above, are balanced to a point where you get the best possible bang for your buck, but they also simply work. Often times, these will get you more value than even the more expensive models available on the market at any given time. It is as simple as that.